Conservatories by H Jarvis add space and style to any home with a light, airy and spacious enhancement which can transform the way homes are used in everyday life. A conservatory completes the total fenestration package, with ours manufactured and fitted to a standard which perfectly matches our windows and doors. Unlike most window and door fabricators operating in the housebuilding sector, we can provide a comprehensive conservatory design, manufacture and installation service. 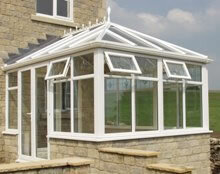 Every H Jarvis conservatory is engineered for structural reliability, longevity and safety. The roof is constructed using an aluminium framework which is clad with high performance PVC profiles which are produced in the same plant as all our windows and doors. All structural connections are securely bolted, mostly double bolted, to ensure long term structural integrity and peace of mind. Given the importance of safety, durability and the fact that conservatories must withstand adverse weather conditions – including heavy snow loading – we believe our construction methods are superior. 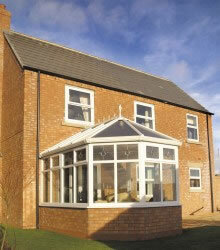 We glaze our conservatory roofs in either polycarbonate sheet or double glazed glass units. Multi wall polycarbonate sheet is available in a wide range of colours and finishes such as clear, bronze and opal. Polycarbonate sheet is very durable and highly resistant to the effects of natural sunlight and ultra-violet (UV) light. Depending on the size and style of the conservatory, double glazed glass units can be used instead in the roof to match the glass used in the windows and doors in the rest of the conservatory. Tinted glass is also available and enhanced thermal efficiency can be achieved with the use of Pilkington Activ™ glass. Problems can arise at both ends of the temperature scale without proper consideration of ventilation requirements. Conservatories can retain heat during warm, sunny weather when the windows are closed and this is concentrated in the roof space. During cooler months, the windows are usually closed to retain warmth and this can lead to problems with condensation. 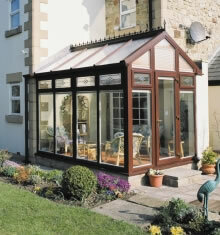 To help maintain a comfortable environment, we can design conservatories with an optional ‘background’ ventilation system which helps to circulate air within the roof structure. Concealed slots within the roof’s eaves beam assembly draw cooler air from the outside and warmer air inside the conservatory is released to the outside in a controllable way through slots in the ridge.